From the Department of Laboratory Medicine and Pathobiology (A.F.G., D.G.M. ), University of Toronto; Division of Neurology (P.A.S., C.D.K.) and Division of Rheumatology (O.V. ), Department of Medicine, St. Michael's Hospital; and Department of Laboratory Medicine (A.F.G., D.G.M. ), St. Michael's Hospital, Toronto, Ontario, Canada. Brachio-cervical inflammatory myopathy (BCIM) is a unique clinicopathologic entity characterized by neck and upper extremity weakness with relative sparing of lower extremities and commonly associated with connective tissue diseases or myasthenia gravis and serum autoantibodies (e.g., antinuclear antibody [ANA], anti–double stranded DNA [dsDNA], and anti–acetylcholine receptor).1 Muscle pathology is distinctive, with prominent B-cell infiltrates and endomysial membrane attack complex (MAC; C5b-9) deposition. Despite the detailed original series, there have been no subsequent reports (besides abstracts2,3) demonstrating the full clinicopathologic features of BCIM. We report an exemplary case of BCIM associated with clinical features of scleroderma and lupus serology. We review isolated reports suggestive of BCIM and contrast its pathology with other idiopathic inflammatory myopathies (IIMs). A 31-year-old woman experienced unintentional 32-pound weight loss during pregnancy. Following delivery, the patient reported painless progressive weakness in her proximal upper extremities and dysphagia. Four months later, examination revealed thickening and soft tissue swelling in the face and distal upper extremities. There was acro-osteolysis of the fingers and abnormal dilated nail fold capillaries. There was severe bilateral, right worse than left, upper extremity weakness (2 to 3/5) with sparing of the lower extremities and moderate neck flexor and extensor weakness. Bloodwork revealed elevated creatine kinase [CK] (5,085 IU/L) level and positive serology including ANA, extractable nuclear antigen (anti-Ro), anti-dsDNA, anti-Ro 52, and anti-Ku. Myositis-specific antibodies were negative. CT of the chest/abdomen/pelvis and MRI of the cervical spine were normal. Baseline pulmonary function tests were unremarkable. Needle electromyography of the right arm showed fibrillation potentials and early recruitment of motor unit potentials in all muscles. Muscle biopsy of the left biceps showed a florid inflammatory myopathy with the distinctive prominent B-cell infiltrates and endomysial MAC deposition (figure). 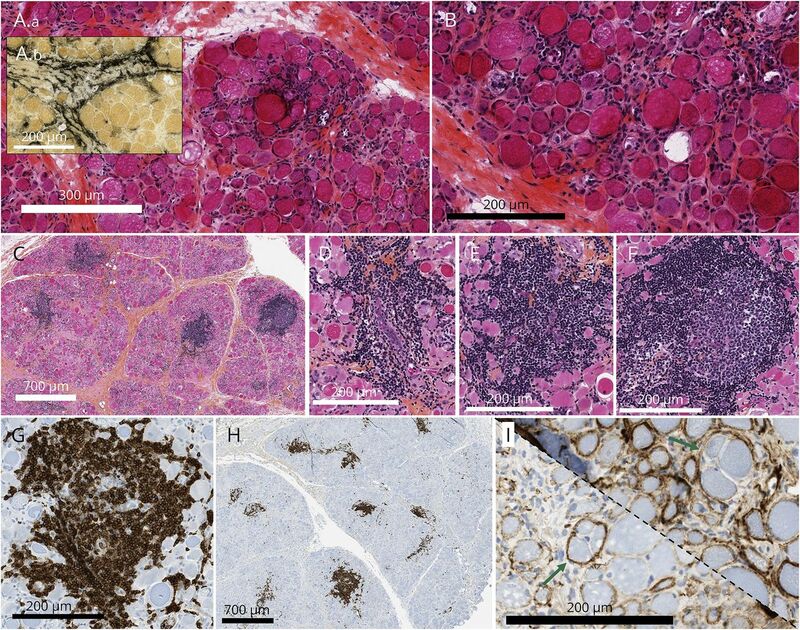 (A.a, B) Cryostat sections stained with hematoxylin phloxine saffron show widespread muscle fiber atrophy without perifascicular distribution, endomysial fibrosis, and numerous necrotic and regenerating fibers. (A.b) Alkaline phosphatase staining of the perimysium. (C) Multiple inflammatory foci, with a perivascular and perimysial (D) and endomysial distribution (E). Germinal centers with polarization were occasionally seen (F), which stained for CD10 and bcl-6, but not bcl-2, ruling out follicular lymphoma (not shown). Immunohistochemistry showed that inflammatory infiltrates were composed of CD20+ B cells (G) along with CD4+ and CD8+ T cells (not shown). Multiple CD20+ B-cell foci were appreciated (H). Membrane attack complex (MAC) deposition was widespread in the endomysium, with several examples of MAC deposition around multiple fibers, confirming its endomysial location (I, green arrows). The patient was treated with high-dose IV methylprednisolone for 4 days, followed by 1 mg/kg oral prednisone and a gradual taper and azathioprine. She received monthly IV immunoglobulin. At 5-month follow-up, strength improved 4+/5 in the affected muscles. The CK level declined to 167 IU/L. Dysphagia improved, and G-tube feeding could be discontinued with resumption of solid oral diet. Our case is a prototypical example of BCIM, demonstrating the clinicopathologic features first described by Pestronk.1 They reported that the most commonly associated conditions were myasthenia gravis (40%) and rheumatoid arthritis (20%). Muscle biopsies showed extensive inflammatory infiltrates with at least 1 prominent CD20+ B-cell focus, major histocompatibility complex class I expression on muscle sarcolemma, and endomysial deposition of MAC (9/10). Corticosteroid treatment resulted in improvement in 7/7 patients. We extend the original description of BCIM by reporting a patient with associated features of scleroderma, including thickening of the skin in the face and upper extremities and acro-osteolysis of the fingers. Of interest, her serology showed antibodies relatively specific for systemic lupus erythematosus (anti-dsDNA), along with myositis-associated antibodies anti-Ro52 and anti-Ku. In the larger series,1,4 the referring diagnoses were rarely myopathy (with motor neuron disease and myasthenia gravis being the most common), highlighting that the brachio-cervical pattern of weakness is an under-recognized presentation of inflammatory myopathy. This has important clinical implications, given the treatable nature of this condition. Based on a pathologic classification of IIMs, BCIM can be placed within the category of IIM with endomysial pathology.7 It is distinguished from dermatomyositis by the absence of perifascicular pathology, lack of MAC deposition on capillaries, and a more prominent B-cell component. Among IIMs, endomysial MAC deposition is a distinctive feature of BCIM. The diagnosis of IIMs has become increasingly complex with a rapid discovery of myositis-specific and myositis-associated autoantibodies and more sophisticated and detailed pathologic examination of muscle biopsies. Careful clinical-serologic-pathologic correlation will be needed for future classification systems, a central requirement of which will be muscle biopsy. Pathologic findings may have treatment implications: prominent B-cell foci suggest a possible role for B-cell depleting agents such as rituximab, and a therapeutic response has been reported in 1 steroid-refractory case.1 Our report well demonstrates that even with myriad overlapping clinical and serologic features, muscle biopsy can reveal a very distinct pattern of pathology that defines a unique clinicopathologic entity. Author contributions: A.F.G. : conception and initial manuscript draft. P.A.S. : initial manuscript draft. C.D.K. and O.V. : critical review of the manuscript. D.G.M. : conception and critical review of the manuscript. Disclosure: A.F. Gao, P.A. Saleh, C.D. Kassardjian, and O. Vinik report no disclosures. D.G. Munoz received research support from the Physicians' Services Incorporated Foundation (Canada) and the Michael J. Fox Foundation for Parkinson's Research, Radiological Society of North America. Go to Neurology.org/nn for full disclosure forms. The Article Processing Charge was funded by the authors. Accepted in final form September 5, 2017.
. Two women with brachio-cervical inflammatory myopathy (BCIM) and fatal cardiomyopathy. Neuromuscul Disord 2015;25:S308.
. Brachio-cervical inflammatory myopathy—a case report. Neuromuscul Disord 2011;21:733–734.
. Cervicobrachial polymyositis. J Clin Neuromuscul Dis 2014;16:59–68.
. Dropped head syndrome as a presenting sign of scleromyositis. J Neurol Sci 2010;292:101–103.
. Paraspinal and scapular myopathy associated with scleroderma. J Clin Neuromuscul Dis 2010;11:213–222.
. Acquired immune and inflammatory myopathies: pathologic classification. Curr Opin Rheumatol 2011;23:595–604.